Many people try to whiten your teeth by bleaching or use whitening toothpaste containing. Unfortunately, not everyone likes doing that way. Certain fruits also can help whiten teeth. Anything? Having white teeth and charming smile would make someone look more attractive. But the habit of drinking coffee, tea or cola can leave stains on your teeth. 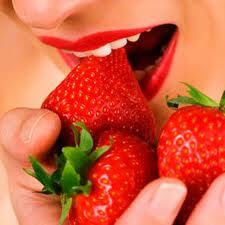 Strawberries are one of the foods that can naturally whiten teeth. Contained malic acid in strawberries act as a substance that would erode and remove a few stains on the tooth surface. Strawberries are blended with half a teaspoon of baking soda can act as a tooth whitener. Apply the mixture to the tooth surface for 5 minutes to obtain satisfactory results. However, this method should not be done in a long time because it could be acid in strawberries can destroy tooth enamel over time. Apples contain two qualities that help in teeth whitening. First, the process of chewing apples are hard and crunchy could fade dental plaque that can change the color of teeth. In addition, chewing also stimulates saliva production which can naturally fight bacteria in the mouth that change the color of teeth. Second, apples contain malic acid which acts as a natural ingredient to 'relax' and remove stains on tooth surfaces. Carrots can also function as a natural tooth whitener. Such as apples, carrots are the food that can fade the hard dental plaque during the process of chewing. Lemon juice can also be used to whiten teeth. Lemon juice can be combined with salt or baking soda to make a paste, which is then brushed my teeth for several minutes. But because lemon juice contains citric acid which can cause corrosion of tooth enamel, always rinse and brush your teeth properly after using lemon juice on teeth.